Set in America in the 1930s, the narrator tells us that ‘The Glass Menagerie‘ is a memory play and as such it is not realistic, as our memories select only what they want to remember. He tells us who the main characters in the play are, including Jim, the gentleman caller, who is intended to be a symbolic character, ‘he is the long delayed but always expected something that we live for’. The narrator also points out the larger-than-life-size photograph of the father on the wall: considered as the play’s fifth character, he actually appears only as a photograph. The character Tom takes on the role of narrator as well as son to Amanda. A poet at heart, he has a job at a warehouse and it is his wages that pay the rent for the family. Tom feels trapped, referring at one point to ‘this 2 by 4 situation’, meaning that he feels as though he is nailed into a coffin. His nightly visits to the movies provide a fleeting escape, but he has an appetite for adventure that is not satisfied by merely watching a film. Amanda, the mother of Tom and Laura, seems extremely irritating in some ways. When we first meet her she is telling her grown-up son Tom how to eat his breakfast. She insists on how important it is to chew food properly and ‘give his salivary glands a chance to function’. She says he should take his time to really enjoy his food, but the way she talks understandably has the opposite of the desired effect. Tom wants to leave the table, telling his mother that she has spoiled his appetite. It is easy to feel sympathetic towards him at this point. However, it soon becomes apparent that Amanda is living in the past and is out of touch with reality; not surprisingly, as her husband has abandoned her – not for another woman, but because of his lust for travel. She reminisces about the days when she had ‘gentleman callers’ before her marriage and entertained them with the ‘art of conversation’. She is now waiting for the moment when another such gentleman caller will arrive upon the scene, this time for her daughter Laura. Laura is a delicate and oversensitive character, as fragile as her beloved glass menagerie. She realises that her personality does not compare with that of her mother in her younger days, and tries to convince her that this is the case. The unfortunate Laura has one leg shorter than the other and has to wear a brace, which to her means no gentleman will ever show an interest in her. In Scene 2, Amanda discovers that Laura, who enrolled in a Business College six weeks previously, has not been attending her course. Laura is portrayed as a nervous wreck whose hands trembled so much she couldn’t type; after being sick all over the floor in class, she felt unable to return, and spent her days at the zoo, the art museum, the movies, or in a tropical glass-house, suggesting a link with her glass menagerie. Amanda is distraught to think that Laura has deceived her, and she wonders what will become of her daughter now that the prospect of a business career has vanished. By Scene 3 Amanda has become obsessed with the idea of finding a gentleman caller for Laura. Arguments ensure between Amanda and Tom; when Tom apologises for calling his mother an ‘ugly – babbling old – witch’, Amanda admits that she worries so much about the future that she doesn’t sleep well and this makes her nervous. Sending Laura out on an errand, she puts the onus on Tom to find a ‘clean-living’ young man at his place of work and invite him home as a ‘gentleman caller’ for his sister. Reluctant at first, Tom does in fact find someone to invite for dinner, a young man called Jim whom he remembers was at school with his sister. Amanda is understandably overexcited and reminisces of her youth again; Laura begins to feel sick with trepidation but has to face up to this meeting. Any more details of the plot would spoil the ending of the play. But it is significant that just before Jim’s visit Laura is described as being ‘like a piece of translucent glass touched by light, given a momentary radiance, not actual, not lasting’, and the link to her glass menagerie here is quite clear. This is a logical play where one scene flows very naturally into the next. My sympathies, however, seemed to fluctuate between Amanda, Tom and Laura. Laura would seem to be a girl to be pitied, yet it seems she is not mature enough to understand the gravity of her family’s situation or appreciate her mother’s concerns about the future. How long would she have continued to drift about, had her mother not realised she had dropped out of college? Amanda speaks to Tom in the most annoying ways and doesn’t appear to show much appreciation of the fact that he is supporting her financially. Neither does she understand his need to escape for a few hours each evening. Yet when we consider her circumstances (and I’m surprised she still has a photograph of her husband on the wall), she is to be admired in so far as she is devoted to her children and wants them to have a secure future. Tom is blatantly rude on several occasions, but it is easy to see how he longs for something outside of the walls of the apartment. He does seem to have a genuine affection for his sister, and there is a poignant passage in his final speech when he passes a window filled with ‘pieces of coloured glass ….. like bits of a shattered rainbow’. The rainbow imagery occurs at several points in the play as a symbol of something beautiful yet intangible and so transitory. 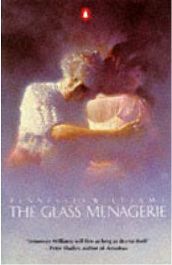 I have only read the book of ‘The Glass Menagerie‘ and would jump at the chance of seeing a live performance, as various theatrical devices such as a transparent fourth wall of the building and the use of music that suggests changing atmosphere. Even just through reading, however, this comes over as a brilliant piece of drama observing intertwined personalities in a situation of conflicting wants and needs that almost all of us can relate to in some way. No Comments on "The Glass Menagerie"